Eric was born in Brighton, Sussex in 1951 and received an art education at West Sussex College of Art and Design. Eric continued with his art through the years on a spare time basis and settled down with his wife Sally in the West Country in the late 1970's and started selling artwork at local exhibitions around Bristol and Bath. In 2000, he gained a number of important painting commissions which rekindled his passion as an artist. In 2006 he completed a study in Life Drawing at the Bristol Academy of Art and in 2007 he moved to Cornwall with Sally and is now living just outside St. Just on the wild and windy Penwith Peninsular. He has held a number of successful exhibits in Brittany, the Algarve and Guernsey and have sold artwork at a number of Art Shows in London, Edinburgh, York and Worcester. "I would say that I am a landscape artist although my main interest is in the detail of the landscape. When painting outside you will find me on the edge or at the bottom of the sea cliffs, in among the hedgerows and searching the commons for prehistoric sites of our secret landscape. I revel in nature’s strong sunlight and wild winds, trying to capture nature’s plant life at its best. 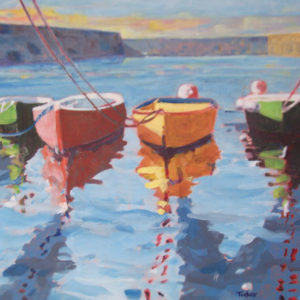 Rob is a Guernsey artist who feels passionately about recording life through painting. 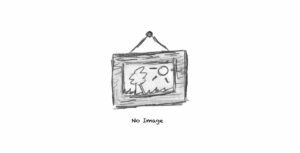 In 1999 Rob completed his "Record in Time" where he completed a painting a day - 365 paintings depicting local scenes in one year. Guernsey has such a varied and beautiful landscape and heritage that there is always something to be inspired by. Rob also teaches art. Richard Le Goupillot, born and educated in Guernsey, moved to the U.K. in 1968 to train as an art teacher. In 1974, having trained and taught in West Sussex, returned to Guernsey and worked in three of the Island’s Secondary Schools, also during this period taught Adult Evening Classes in Drawing, painting and Ceramics. Began showing paintings in local exhibitions and creating ceramic pieces for sale and to commission. Richard retired from teaching in 2007 and now concentrates on painting in Oils and Acrylics, subject matter includes paintings based on local seascapes through to semi-abstract work, and artwork inspired by the shape and pattern of natural forms. In recent years have linked with Rob Sweeney to have three exhibitions of work together. (1921-2008) to many people in Guernsey the name Charles Jaques is synonymous with local art. Born in London's East End Charles was a true cockney. His father was an engineer, as well as a talented painter and woodworker, and his mother worked as a dressmaker in the city. His art master at the Grammar school there had a profound influence on him and steered him towards his eventual artistic career. Jaques trained at Goldsmiths College of Art until the outbreak of the Second World War, when he joined the Army and served in the 7th Armoured Division the 'Desert Rats'. He later taught art at Thornbury Grammar school in Bristol before moving to Cornwall where he was instrumental in founding a school of water-colour painting. He moved to Guernsey in 1975 where he continued to teach art, he was a well-loved art teacher in Guernsey. Jaques was a keen sailor, and many of his paintings depict boats and the sea. He exhibited at the Mill Street Gallery, Coach House Gallery, CHG, and SAC, and in his later life Sula Gallery. His painting depicting the "Wreck of the Orion" of Grandes Rocques hange in the Guernsey Museum Gallery within Castle Cornet. Le Vasseur was born in the Channel Islands in 1938. He and his parents left as refugees, travelling to England, prior to the occupation of all the Channel Islands by the Nazis. In 1951, aged thirteen, he won a scholarship to Harrow Art College. In 1963, his first exhibition, at the Portal Gallery in Mayfair, London, was a sell-out. This first show led to a further five one-man shows at this gallery over the next ten years. During the sixties, Le Vasseur sold paintings to the Beatles, film stars Rod Steiger and Jerry Lewis, and many other well-known people, including the Duke of Bedford and Lord Porchester. Le Vasseur had a painting in the book "The Beatles Illustrated Lyrics", which sold three and a half million copies. Fellow contributors to the book were David Hockney, Allen Jones, Erté, David Bailey, and Sir Eduardo Paolozzi. In 1969 David Puttnam (now Lord Puttnam) acquired a commission for Le Vasseur to produce a series of paintings for The Sunday Times and the National Film Archive, entitled "The History of Cinema". In 1971 this won an award for the Sunday Times. In 1975 Peter decided to return to live in the Channel Islands with his wife Linda, where he works in a cottage tucked away in the lanes of St. Pierre du Bois in Guernsey. In 1993 he was the first artist to win an Earthwatch Scientific Foundation Fellowship, which enabled him to document the flora and fauna of the fast disappearing rain forests of South America. He has also travelled widely in the Middle East, the United Arab Emirates, and Oman. In Africa, during the last ten years, Le Vasseur has visited Morocco, Tunisia, Tanzania, Egypt, Kenya, Zambia, Zimbabwe, Botswana and South Africa, collecting material for his paintings. Paintings in the public collections of: Boston University, USA, Guernsey Art Gallery and Museum and Scottish Assembly building (Parliament building). Drawing has always been second nature to Wendy. As a child she was encouraged to draw from life and wherever possible still does especially with her own work. Growing up Wendy was lucky enough to be brought up in the beautiful surroundings of Guernsey with beaches, rock pools and nature in abundance. The ancient dolmens and standing stones were all part of her playground and stories of fairies and witches fuelled Wendy's imagination. From Guernsey Wendy went to Winchester to do a year’s foundation and fell in love with the landscape, vowing to return someday. Her next three years were spent at Harrow School of Art studying illustration and she left there with a distinction in 1974. From art school Wendy was fortunate to be employed by the Natural History Museum in London before becoming a freelance illustrator. In 1985 Wendy moved back to Winchester with her family and now lives on the edge of the city surrounded by beautiful down land. Ale started drawing when he was a child and he never quit. Today he works as an illustrator for several brands, publishers and agencies in areas such as advertising, publishing, entertainment, social contents, books and comics. he teaches illustration at IED (European Design Institute in Turin), Scuola Internazionale di Comics (Padua) and IDEA Academy (Rome). Ale is an art director at Illustri Festival an international biennial illustration exhibition taking place in Vicenza (Italy). In 2017 he founded Magnifico Illustrators Agency. Gilbert Spencer (4 August 1892 – 14 January 1979) was a British painter of landscapes, portraits, figure compositions and mural decorations. He worked in oils and watercolour. He was the younger brother of the painter Sir Stanley Spencer. While at the Slade in 1919, Gilbert Spencer met Hilda Carline, later to become the wife of Stanley, and her brother Sydney Carline, who was the Ruskin master of drawing at Oxford. During 1922, Sydney invited Gilbert to join his staff in Oxford. This provided him with a convenient way of life until he could put on his first one-man show at the Goupil Gallery, London, in 1923. He met Lady Ottoline Morrell who assisted him by arranging a room for him in the village of Garsington and allowing him easy access to Garsington Manor. Thus he came into contact with many notable artists and members of the Bloomsbury set. His paintings of this time, such as Trees at Garsington (Ashmolean Museum, Oxford), Garsington Roofs, and The Sheep Fold at Upper Farm, have a characteristic directness of line and clarity of colour. He was elected an Associate Royal Academician (A.R.A) in 1950 and a full member in 1959. He temporarily resigned his membership of the Royal Academy in 1968, before re-joining in 1971. The artist was widely exhibited during his lifetime and examples of his work are held in major public and private collections, including the Tate Gallery and the Royal Academy. From 1932 to 1948 Gilbert Spencer was Professor of Painting at the Royal College of Art in London. He was also Head of the Department of Painting at Glasgow School of Art, 1948–50 and, from 1950 to 1957, was Head of Painting at Camberwell School of Arts and Crafts under the Principal Leonard Daniels. 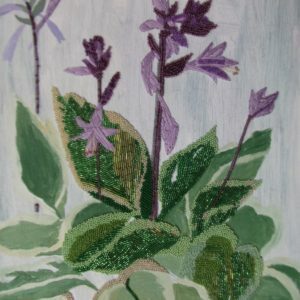 Hayley Mallett is a textile and mixed media artists with a love of beads and colour, often influenced by nature, Hayley's paintings and prints create the perfect addition to any home, whether it be for a nursery or adult space. Hayley studied Textile design at University College Falmouth, and graduated in 2007. She then returned home to the island of Guernsey in the Channel Islands, where she took over Sula Framing and Gallery with her Dad. Hayley's inspirations are mostly plants and animals - when she was younger she was a Sunday girl in a local garden centre, and her parents had greenhouses, so she was always surrounded with lots of stimulation. Thanks to Hayley's design background she works closely with trending colours that she knows will work well in the home. She has participated in both group and solo exhibitions and her work hangs in private collections all over the world. In 2012 she was lucky enough to be filmed for ITV's 'Island Hospital' where she was filmed preparing for her first solo exhibition and had quite a flurry of sales that came in after it was shown. If you are looking for a particular colour painting to fit with your decor then Hayley is happy to work with you to come up with a design, as she has done with many customers in the past. 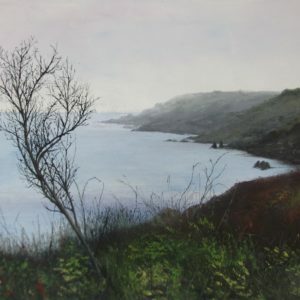 Sheila Noble was born in Margate in 1933 and moved to Guernsey in 1978, she has exhibited with The Society of Marine Artists at The Guild Hall, in the city of London four years after she started painting; she also had her first solo exhibition at the Mall Galleries London in 1978. She exhibited among others at the Society of Women Artists in 1979, at St James's Gallery, St Peter Port in 1981, 1985 and 1987, and many others, in 2008 she also celebrated 30 years of painting at Jimmy's in St James. Before moving to the Island with her Guernsey born husband, the Polish artist Bozena Pollock studied at the Art College in Krakow and then Chelsea College of Art and Design in London. She also completed a BSc in Restoration & Conservation at London Metropolitan University, going on to work in this area before having her two children. Bozena's landscapes communicate the movement and complex forms that appear in nature using expressive but controlled lines. The energy and deeply expressionistic hues within the painting, reminiscent of Polish Expressionists such as Gustaw Gwozdecki (1880-1935). Bozena now juggles a busy family life with her painting, taking advantage of the rare occasions she can retreat to her studio. 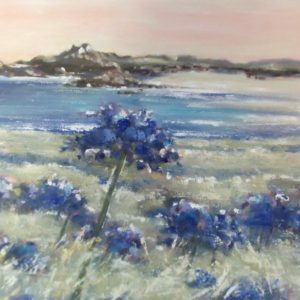 Bridget is an artist living and working on the beautiful island of Guernsey, in the Channel Islands. She was born in England, but has travelled extensively throughout her life. She lived in Brazil for seven years in her youth. Her education includes a degree in Jewellery Design gained at Central St Martins (where she won The Gold Prize awarded by Goldsmiths Hall) and a PGCE in Art and Design at the University of Brighton. As a jewellery designer she created work for, amongst others, Jasper Conran, Vivienne Westwood and Bulgari, establishing her own jewellery design business in 1991. Being a painter at heart led her to become a secondary school, Art and Design teacher, where she delighted in sharing her knowledge and skills with her students. 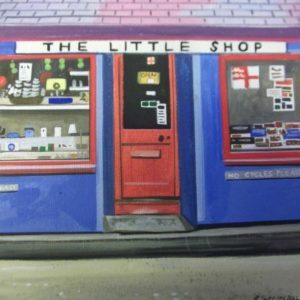 Since becoming a mother, of two sons she has followed her true passion for painting, has run a small gallery selling her own and other artists work. Bridget’s paintings have been selected for many exhibitions including Southampton City Art Gallery and The Royal West of England Academy. Bridget’s work (which is owned by many private collectors) is mixed media, predominantly acrylic with textured surfaces and layering. She loves the idea of creating a sense of history, paint peeling to reveal text or imagery and organic patinas. The work she creates is instinctive, emotive, experimental and filled with energy, inspired by the chaos of nature. Frank Bowling, Cy Twombly and Barbara Rae are great influences as well as the greats Picasso and Matisse. Sailing has played a large part in Bridget’s life. She has sailed across the Atlantic twice once as a crew of two to the Caribbean and the other with her husband and two young sons to introduce her family to her second home, Brazil. Boats, seascapes, people and the homes and buildings that have special meaning for them -- these are the foundations of Murray's work as an artist. His travels to Guernsey, Channel Islands, the home of his family and where he spent many formative years, and his travels throughout Canada, where he now lives and finds inspiration, providing the images and impressions that are the subjects of his latest works. He has a fascination with line, its inward and outward curves, how it separates human from natural space, how it can transmute the physical and visual history of a building or landscape into their present day forms. His passion for history and the dimensions of line have inspired him to create a series of pen and ink drawings based on the history of Guernsey. In addition to his Guernsey series, he is often commissioned by clients to create pen and ink drawings of their homes, their families or a favorite car or boat. In each drawing, his challenge is to depict the unique personalities of the subjects. For his paintings, Murray favors acrylic on stretched canvas. Acrylic allows him to lay washes of color to reflect depth and atmosphere and it allows him to represent the vagaries of light, its conflict with shadow, and how colors are transformed by both. Murray now lives and works in Guelph, Ontario, Canada. Having studied with such established artists as Nan Hogg, Kathleen Schmalz, and Janette Hayhoe, he work out of a studio in Guelph as well as on location. Naftel was born on 10 September 1817 in Guernsey. 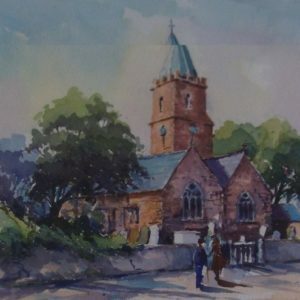 He was a self-taught artist and taught drawing at Elizabeth College on Guernsey. Naftel was extremely prolific, producing over 1000 works during his lifetime. He came to particular prominence when he recorded Queen Victoria's visit to Guernsey in 1846, with the resulting prints published in the Illustrated London News. In 1856 he was elected to the Society of Painters in Water-colours. He married twice. His second wife, Isabel Oakley, was an artist and the youngest daughter of Octavius Oakley. Naftel's second marriage produced two sons and a daughter, Maud Naftel (1856–1890) who was also a successful artist. Naftel moved to London in 1870 where he had a highly successful solo exhibition at the gallery of the Fine Art Society. At his art studio in London he taught Rose Maynard Barton and Mildred Ann Butler. Like most artists, Maggie's art practice tends to be influenced by her immediate environment. 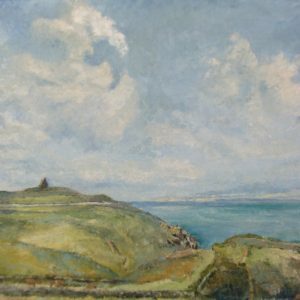 In 2006 she moved from London to St Just in the far West of Cornwall and began to tentatively paint the stunning Cornish landscape. 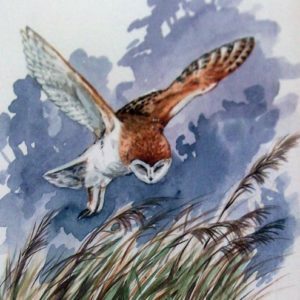 She paints and draws outside whenever she can and is most concerned with the elemental, with the effects of weather and light and the changing seasons. She uses a variety of techniques and materials and the work is a mixture of place, memory and imagination. In 2011 she moved from the North Coast to the more lyrical South. She now lives next to a farm just above St Loy, a remote cove between Porthcurno and Lamorna. Wooded Valleys, sheltered coves and gentler weather encourages an abundance of wildlife in this part of Cornwall and this has inevitably crept into her work. It is informed by the ancient cycles of life on the farm, by the birds that nest in the barns and trees and by the creatures that inhabit the woods and fields. A lifelong love of animals has become something deeper and richer, with a new sense of the mysterious connectedness of things in this wild and remote part of Cornwall. With this sense of connection however, there is increasing concern and growing sense of responsibility about the way we treat those beings who share the planet with us. The latest research shows they have rich emotional lives and high levels of communication. Her latest work explores our relationship to animals and birds and what she believes we can learn from them. Samuel Earp, a traditional realism artist who loves to paint landscapes in oils, especially scenes of New Zealand, Australia and Guernsey among others. He was born on the island of Guernsey in 1979 but grew up in the South West of England where he did a lot of drawing and painting from an early age, he always loved landscape art even as a child. He moved to the beautiful country of New Zealand in 2009 and has been there ever since. He has a passion for painting landscapes, especially water and the sea, which he enjoys painting most of all. He also loves to paint outdoors on location (en plein air). 'I love recreating the colours, light and atmosphere of nature on canvas. Painting gives me an enormous sense of well-being and connectedness'. He especially loves the dramatic landscapes and beautiful colours that are so unique to the New Zealand wilderness and channels this into his mountain paintings. Paul Bisson was born in Guernsey in 1938 and was educated at Elizabeth College, before attending Shebbear college in Devon, He studied from 1954-1958 at St. Martin's School of Art in London working under Anthony Caro, Ruskin Spear, and Fredrick Gore. On completion of his course, from 1958-61 he furthered his study of painting in the Royal Academy Schools. On completion of his studies Paul spent an extended period painting abroad, and also immersed himself in the examination of the English countryside. He emerged as an artist acclaimed to be one of England’s most prominent interpreters of landscape. 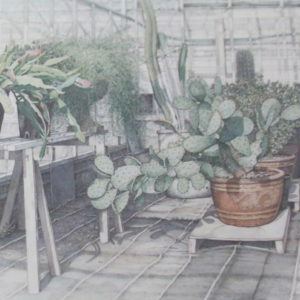 Paul returned to London in 1976 and became heavily involved in etching at Morley College, then in 1980 he moved to Sussex where a large studio enabled him to undertake the plate making and printing, and to perfect an etching technique unique to his own style of drawing. The large studio enabled him to work on the many limited edition commissions he received from galleries, institutions and corporations; among them Christies Contemporary Art, The National Trust, Mobil Oil, Book of the Month Club, America and Reich British Art. By the 1980's Paul Bisson had been named the foremost landscape etcher in Europe and had established himself as a prominent artist in the United States. His works are coveted by galleries and private collectors throughout Europe and the United States. The exquisite detail that is portrayed in Paul’s studies in both Oil and water colour may possibly stem from the intricacies of his etching work, his oils and water colours are most delicately executed, with subjects so beautifully portrayed they are understandably valued and loved by collectors and admirers of his work. His work has been exhibited in Japan, U.S.A, Australia and throughout Europe. Collections include: Rank Xerox, Chemical Bank, U.S.A, Chase Manhattan Bank, U.S.A, Dean Whitter Corporation, Steigenberger Gesellschaft, West Germany, Stedelyk Museum, Sony Corporation, Amoco Productions, Biblioteque Nationale, etc. 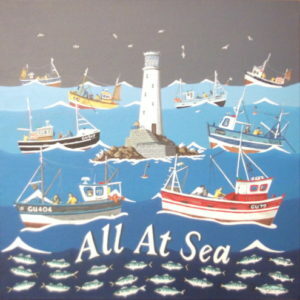 Paul has previously exhibited at the Coach House Gallery Guernsey in 1993, 95, 98, and 2005.